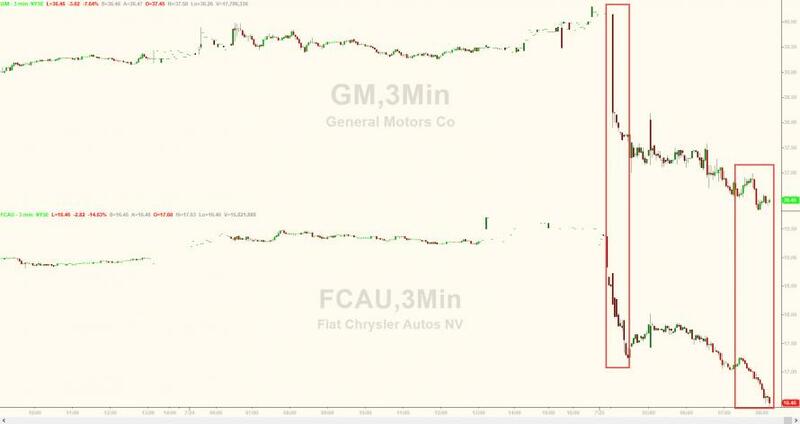 With Trump's meeting with Jean-Claud Juncker set to begin any minute where the discussion of potential tariffs on European cars will be among the most heated topics, WaPo reports that "several" of President Trump’s senior economic advisers believe he plans to impose a 25 percent tariff on close to $200 billion in foreign-made automobiles later this year, three people briefed on discussions said. Trump has said imposing tariffs on foreign cars could push Americans to buy more U.S. automobiles, helping U.S. workers. But critics believe tariffs would drive up the cost of all cars and pass those inflated prices on to consumers. Putting the $200BN number in context, the US imported a record $192BN in new passenger vehicles in 2017, in other words Trump plans to tax all foreign auto imports. Of course, it is common knowledge by now that the E.U. charges a 10% tariff on imports of U.S. automobiles, while the US has a far lower 2.5% tariff on European cars, however it charges a 25% tariff on light truck and sport-utility vehicle imports from other countries. As the WaPo explains Trump wants to move forward despite numerous warnings from GOP leaders and business executives who have argued that such a move could damage the economy and lead to political mutiny. However, as his increasingly belligerent tweets demonstrates, which compare tariffs to Muhammad Ali, Trump has become increasingly defiant in his trade strategy, following his own instincts and intuition and ignoring advice from his inner circle. As a result, he has told advisers and Republicans to simply trust his business acumen, a point he tried to reinforce Wednesday morning in a Twitter post. Meanwhile, ahead of Juncker's visit, Trump said that Juncker has come to negotiate with him over trade matters, "suggesting that his hard-line stance had forced other leaders to offer concessions." The disunity within the White House and Trump’s insistence on pushing ahead on auto tariffs was described by three people briefed on the status of negotiations who spoke on condition of anonymity because they were not authorized to reveal internal deliberations. As the WaPo also notes, Juncker is expected to propose two ideas to try and calm tensions with the White House, a European official briefed on the plan said who spoke on condition of anonymity to describe the E.U. position. 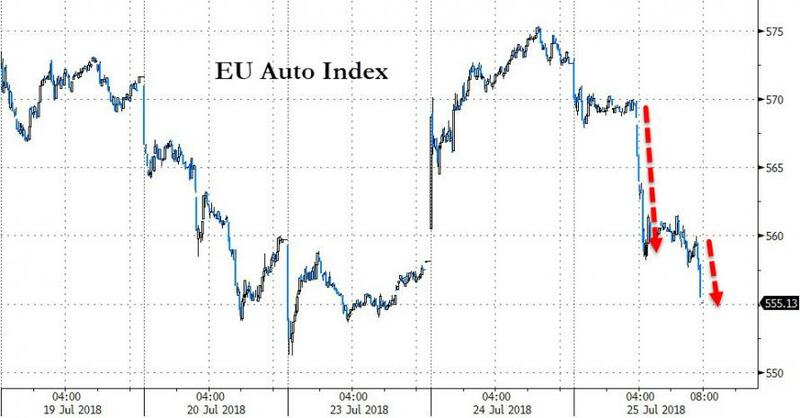 One option would be lower tariffs among all major auto-exporting countries, while another would be a targeted deal between the United States and the E.U. to eliminate tariffs on industrial products, including cars. Trump suggested a similar idea on Twitter Tuesday evening, but he seemed to suggest the Europeans would never accept the proposal he desired, making it appear an agreement was still out of reach. 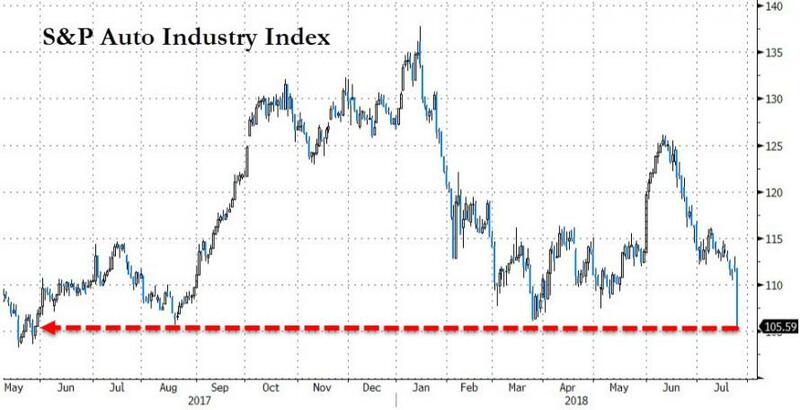 Meanwhile, following today's woeful results from GM and Ford, as the top automakers cut guidance citing rising commodity prices as a result of yet more tariffs, the S&P Auto Industry Index tumbled to the lowest level since May 2017.